Compound-action tool crimps 10-22 AWG insulated terminals to meet or exceed MIL-SPEC pull-out tests. 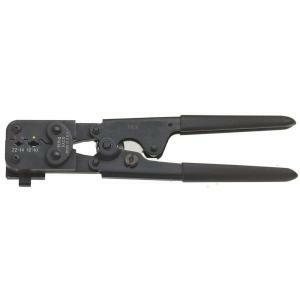 Built-in ratchet with safety release ensures uniform crimps every time. Compound lever-action of narrow-span handles puts more crimping power into each squeeze. Tbook.com crawls the web to find the best prices and availability on Crimpers and related Tools and Hardware products like Klein Tools 9 inch Compound Action Ratcheting Crimper for Insulated Terminals. For this page, related items include products we find that match the following keywords: "Crimper" at our vendor partner Home Depot. Klein Tools 9 inch Compound Action Ratcheting Crimper for Insulated Terminals is one of 41 Crimpers and related products listed in the Tools and Hardware section of Tbook.com If you have any questions on this product, please give us a call at 734-971-1210 during the hours of 9am - 5pm EST for assistance. Thank you for shopping at Tbook.com, the Internet Department Store!